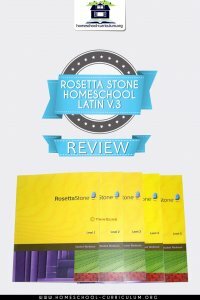 I really like Rosetta Stone Homeschool Latin. I like the way it teaches the language. I am using it, too, and i find that if I don’t think too much about it, I can say and understand a lot of Latin words and sentences. When I start thinking about “how do I decline this noun” or “how do I conjugate this verb,” that’s when I get into trouble. It really is very intuitive. You can’t help but learn the grammar. It’s taught in a way that makes it very easy to learn, so I think people assume that it doesn’t teach it because it doesn’t go into all the parts of speech nomenclature. I can speak and write English perfectly, but if I had to diagram every sentence in my head before I spoke it, I couldn’t do it. That’s what I had to when I learned Spanish the “traditional” way. I can read, write and understand spoken Spanish, but I can’t speak it to save my life. I did teach my older daughter a semester of Latin grammar (taught along side English grammar)before we started Rosetta Stone. She also took 1 high school semester of Latin in public school. So she thinks Rosetta Stone is a breeze. My 6th grader is doing really well, too. Everybody gets 90-100% on every lesson, worksheet and test. I bought Latin 1-3 on sale in a bundle years ago. I think it was $350. That’s better than the online version. I think that’s a rip-off. The speech recognition is kind of buggy as well. Sometimes it just doesn’t work on a certain part of a lesson. We just skip those words/phrases and I don’t worry about it. Customer service is horrible, but they did finally solve my problem. The speech recognition did not work at all. There was a conflict with my internet filter. It took me 8 hours on chat and remote help, but it did get resolved. Unfortunately, I had to take the filter off that computer. If you are doggedly persistent, customer service will fix your issue. But you’ll have to go through a number of techs and supervisors to get it done. Editor’s note: You can read more reviews about this product on Amazon.